As the years pass by, our devices become more and more advanced. Manufacturers are in a rush to equip their devices with top notch specifications with the latest being Samsung’s launch of the Galaxy S6 and the S6 Edge. Apart from a complete design overhaul, the Galaxy S6 duo feature the industry first 14nm Exynos 7420 SoC which has left a lot of manufacturers in a quandry to upgrade their offerings as well. Samsung’s main smartphone rival, Apple also presented us with its processor upgrades last year in the form of the iPhone 6 duo, featuring the company’s A8 and the iPad Air 2, featuring a unique tri-core cyclone devices. 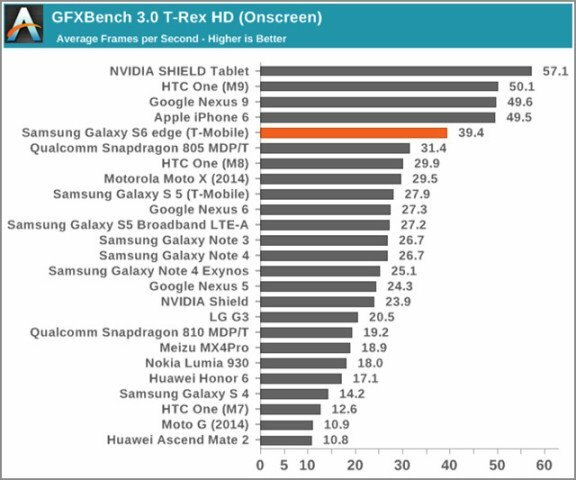 Any benchmarks comparison also won’t be complete without Nvidia’s Tegra K1 equipped Nexus 9, which will also be making an appearance below. As is with all top hardware launches, these too leave us wondering which silicone is the top performer, and courtesy of benchmarks, we’re able to get an accurate idea of which company has managed to edge ahead in the specification race. We’ve been able to get our hands on some benchmarks today, so lets find out conclusively which device truly is worth your time and your wallet. Starting from overall performance benchmarks of all the devices launched this year and last, lets take a look at what Basemark has to offer us. 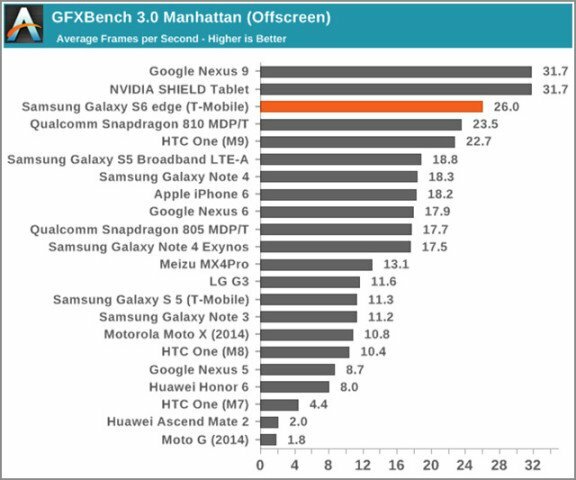 Samsung’s 14nm finFET on the Galaxy S6 Edge seems to be doing its job perfectly well when it comes to the smartphone arena, as the device tops the Snapdragon 810, the HTC One M9 and even the iPhone 6. 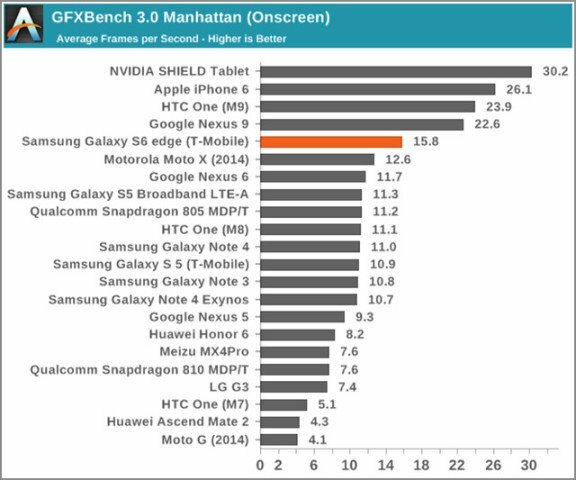 The Tegra K1’s exclusive focus on graphics is also evident, with the Nexus 9 coming in fourth place. 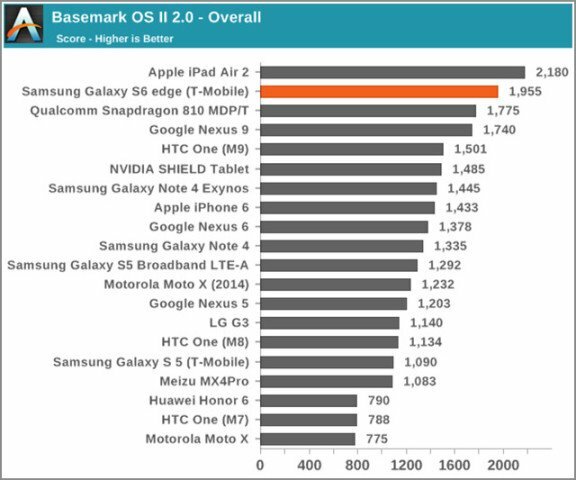 Apple A8X however takes the lead here, showing that Cupertino’s unique tri-core design for the iPad Air 2’s processor has panned out just the way folks over there would like it to. System scores for Basemark (shown above) that focus on overall CPU performance scores, including floating point and integer scores also show similar results to overall Basemark scores for the devices. The Galaxy S6 Edge remains unbeaten by any other device out there, save, once again Apple iPad Air 2 with the A8X on board. 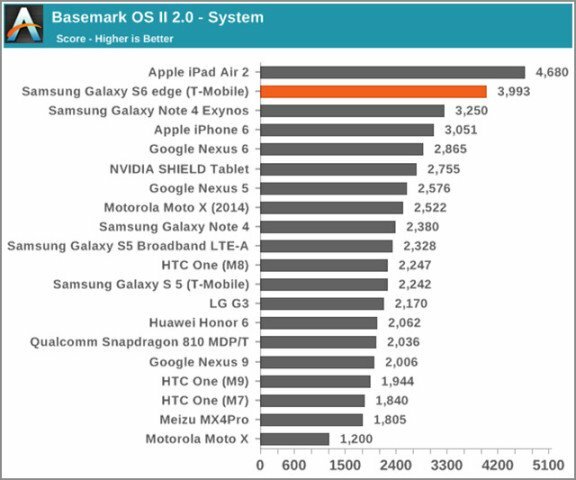 The 20% performance increase that 14nm promises over 20nm is evident here, with even the Galaxy Note 4 with the octa-core, big.LITTLE Exynos 5433 outperforming Apple’s A8 bearing iPhone 6 and iPhone 6 Plus. HTC’s One M9 manages to bag a surprisingly low position here, despite its Snapdragon 810 core. Moving towards data read/write and overall memory performance for all the devices, we see Samsung’s latest flaghships top in both indicators. Sequential Read and Write scores for Samsung’s Galaxy S6 and earlier Galaxy Note 4 are both above the charts. This coupled with both the devices’ Random Read and Write scores will ensure that opening apps and loading data on your device’s won’t be a hassle for any one. Moving towards the more important memory scores, the Galaxy S6 Edge’s lead isn’t that all surprising. Both the Samsung flagships come with LPDDR4 memory on board, which according to Samsung and other figures offers up to 50% performance increase, that allows for frequencies of 25 GB/s, nearly double when compared to the Snapdragon 810 and Exynos 5433’s 13 GB/s. This will no doubt provide the Galaxy S6 duo a strong advantage when it comes to running graphic intensive and performance demanding applications. 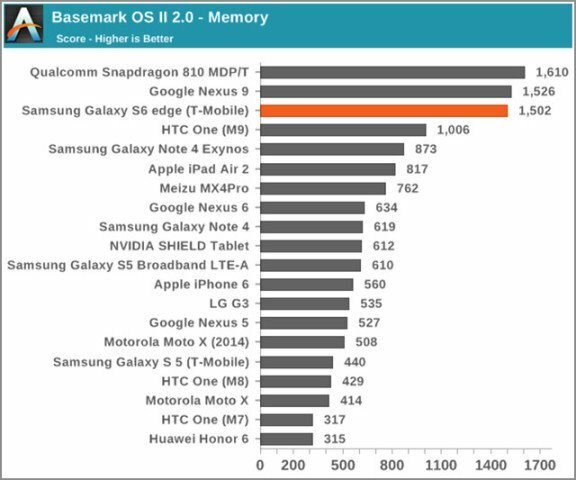 We see the HTC One M9 make a good comeback in memory performance, while core performance leader, the iPad Air 2 and also the iPhone 6 both see themselves pushed to the bottom. Graphics make up for an important aspect of any flagship device’s performance. Aside from gaming, good graphics on your device make for an overall pleasant usage and viewing experience. But achieving good performance in this area often involves a trade off between screen resolution and the GPU since the higher the resolution, the more work your device has to do in order to achieve scalable performance. And resolution is one aspect that seems to have hampered the Galaxy S6 Edge’s graphics performance, as can be seen above. Top contenders in this area are without question Nvidia’s Shield tablet and the Nexus 9, since both come with Nvidia’s Tegra K1, a chip designed with the sole purpose to achieve desktop grade graphical performance on mobile devices. 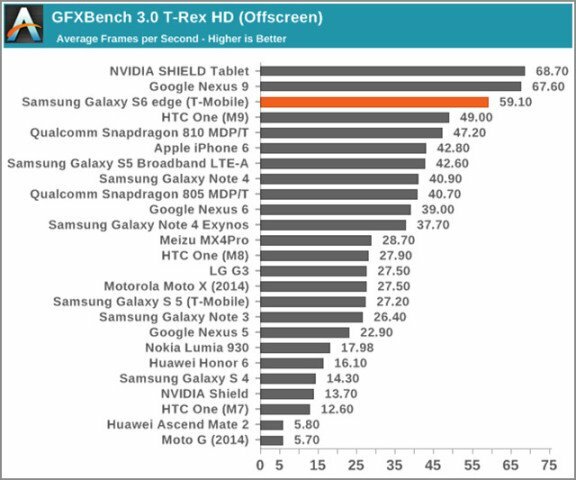 Apple’s iPhone 6 and the HTC One M9 also make it to the top on T-Rex Onscreen, showing the Adreno 430’s capabilities. Things change in the Offscreen test however. Change things to a unified 1080p for Offscreen and you’ll see the Galaxy S6 Edge make a strong comeback, coming in third only to the Tegra K1 devices. The Mali T760 really has its work cut out when On Screen tests are run, but given the relative differences you shouldn’t expect that much of a change for actual performance. Benchmarks are numbers after all, and device choice still boils down to personal preference. The iPhone 6 looses its rank on Off Screen and we see nearly the same results, bar the HTC One M9 moving up a notch when T-Rex is run. So which device, processor or GPU is the best of them of all? Performance wise, the Galaxy S6 Edge courtesy of its Exynos beast manages to beat every device out there. 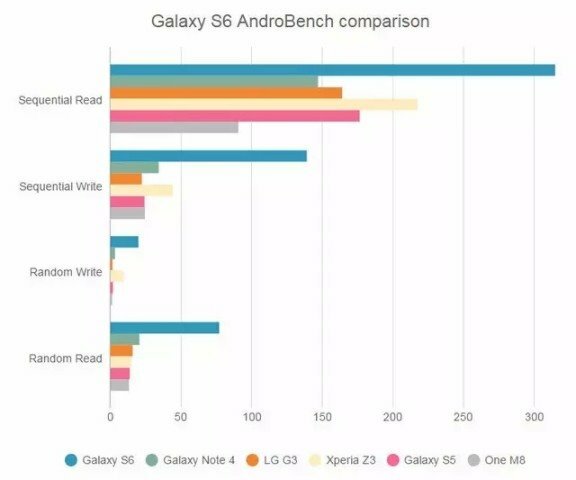 Read/Write scores coupled with memory performance further add to Samsung’s favor and aside from the slight lag on graphics scores, the Galaxy S6 Edge is the device to have, according to these scores (courtesy Anandtech). What will be interesting is Apple’s response to Samsung’s very strong devices later this year. The Cupertino giant certainly has the resources, given the A8X’s strong lead shown above, and with 14nm deals already underway according to sources, Apple shouldn’t be counted out of the run by any measure. Nevertheless, Samsung’s made a strong comeback this year and the company should be happy, given particularly its declining market performance last year. Agree, Disagree? Let us know what you think in the comments section.